Drinking too much milk bad for bones? Bones constantly take up and release calcium throughout life – in both, men and women. However, post-menopausal women are more susceptible to osteoporosis or brittle-bone disease because declining estrogen levels impair the skeleton’s calcium retaining ability. So the most common advice offered to women is to eat plenty of calcium-rich food, particularly, milk and milk-products. 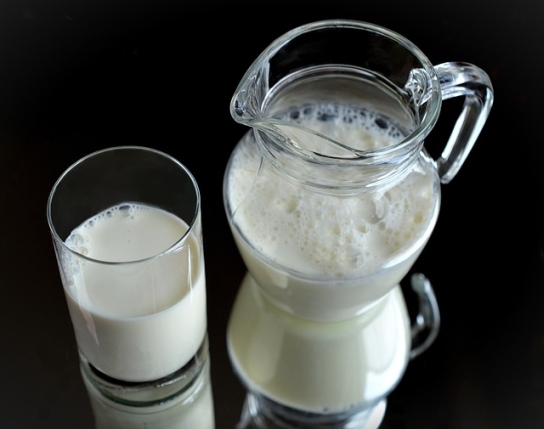 A recent study suggests that while some milk may be good, more is not better. In fact, too much milk may be bad for your health. After adjusting for other variables, they found that women who reported drinking three or more glasses of milk each day nearly doubled their risk of death in relation to women who drank less than one glass each day. Men were not as affected as women, but those who drank three or more glasses of milk each day still showed a significant increase in mortality. Researchers said the increased risk of death they observed could be explained by the high levels of sugars contained in milk, specifically lactose and galactose. While interesting, these findings are too preliminary to warrant a change in nutritional guidelines, add the researchers. In conclusion, drinking milk isn't as bad as touted in some alternative medicine forums; but drinking too much milk may be bad for you. (Do read Milk for health and beauty)There are a lot of other nutrients and lifestyle factors involved in building healthy bones. For instance, regular gardening can give you strong bones. Remember that it's not that milk/ dairy weakens your bones; it's just that dairy alone cannot guarantee you strong bones and consuming any type of food in excess is always bad. Too much of ANYTHING is bad for you. protein is need in the body to build muscles and for other uses - but when you eat more than you need, it is burned as a fuel, which is inneficient and produces harmful chemicals. Also, a well balanced diet should contain a good variety of foods, so that you get all the nutrients you need - they are found in different kinds of food. So, if you eat a lot of just one kind of food, you are not getting some of the nutrients you would get if you spread out your calories over a wider variety (more different kinds) of foods. It's not a great idea to have tons of it. I am a vegetarian/ part vegan. I stopped drinking milk completely a couple months ago, and my acne, and any or all zits totally went away. So that tells you that it affects your body in its negative ways. Drinking an excess of milk will make you gain weight. Milk has calories too, and it also has protein. You don't need a gallon of milk everyday, I would suggest maybe two or three glasses, one for every meal. Skim milk is also a good alternative, but like I said, you don't need a gallon of milk everyday.